Thymomas are rare and usually slowly growing tumors, originating from the epithelial layer of the thymus. Prognosis depends on the extent of invasion of adjacent tissues whereby multimodality treatment including surgery with or without adjuvant chemoradiotherapy is the preferred approach for locally advanced thymomas. For metastatic thymomas, only few chemotherapeutic options are available. 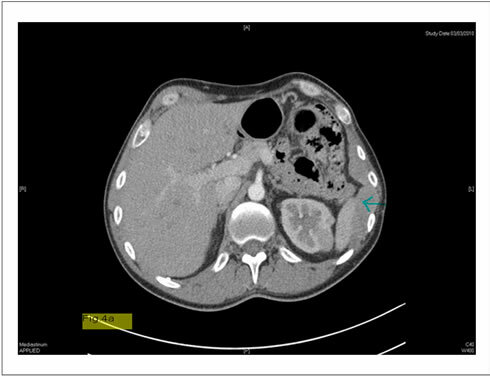 We report 2 cases of patients with metastatic thymic malignancies with a dramatic response on pemetrexed treatment. The choice for this antifolate therapy is based upon a small series. Because metastatic thymic neoplasm is a rare disease, large randomised trials are not feasible. Case reports on the treatment of these malignancies are very important and can provide readers with the opportunity to deal with rare diseases. 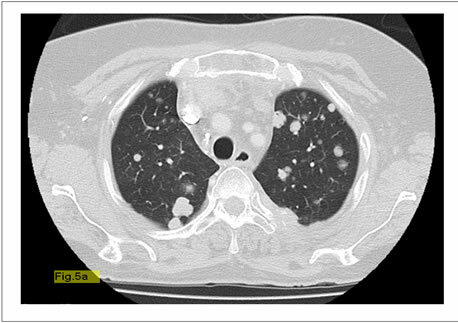 Thymomas are rare tumors arising from the epithelial tissue from the thymus presenting in the anterior mediastinum and account for 20% of mediastinal neoplasms. The incidence of these tumors is merely 2.5 and 3.2 per 106 people in Denmark and the Netherlands respectively [1,2]. Male patients are predominantly affected and usually between the ages of 40 - 60. Patients with thymoma present with persistent cough, hoarseness, dyspnea related to invasion or pressure on adjacent organs. Thymomas can be associated with unique paraneoplastic syndromes such as myasthenia gravis , pure red cell aplasia , hypogammaglobulinemia (Good syndrome)  and other autoimmune diseases. Thymomas differ from thymic carcinomas by histological structure, slower growth rate and better prognosis . Metastatic disease usually consists of pericardial or pleural effusion. Only less than 7% of the patients have extrathoracic metastases . Histopathologically, thymomas are primary tumors of thymic epithelial cells. 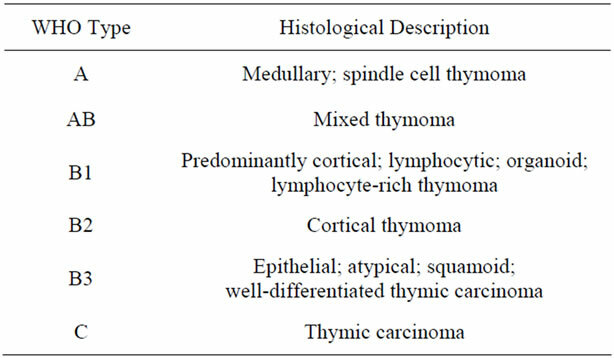 The distinction between thymomas and thymic carcinomas is not as clear because thymic carcinomas have malignant cytological features, whereas thymomas are generally considered cytologycally benign. The WHO histologic classification  focuses on thymic epithelial cell morphology (spindle or epithelioid), the degree of the lymphocytic component, and the presence or absence of epithelial atypia. Epithelial morphology corresponds to medullary or cortical differentiation. The classification reports a continuum of tumors from type A, AB, B1, B2, B3, and thymic carcinomas (Table 1). The widely used staging classification developed by Masaoka et al. in 1981 describes thymomas in terms of the local extension of the tumor. There are four clinical stages, as shown in Table 2 . This staging system is recommended by the ITMIG. The treatment of thymoma includes surgery, radiotherapy and chemotherapy or a combination of these modalities. Surgical resection forms the cornerstone of therapy for early-stage tumors. Approximately 90% of patients with encapsulated thymomas are cured with complete surgical extirpation . In advanced or recurrent thymic malignancies, a multimodality approach incorporating surgery, radiation and chemotherapy is required . However, when this therapy fails, there are no known alternatives to treat recurrent thymic neoplasms because of the rarity of the disease and the poor understanding of the molecular biology of these malignancies. Some targeted agents like multi-kinase inhibitors sunitinib or sorafenib have shown some activity in thymoma [12-14]. Table 1. World Health Organization (WHO) pathologic classification of thymoma. Table 2. Masaoka clinical staging of thymoma. Molecular profiling is therefore promising and may hopefully herald a new treatment paradigm for thymic malignancies. 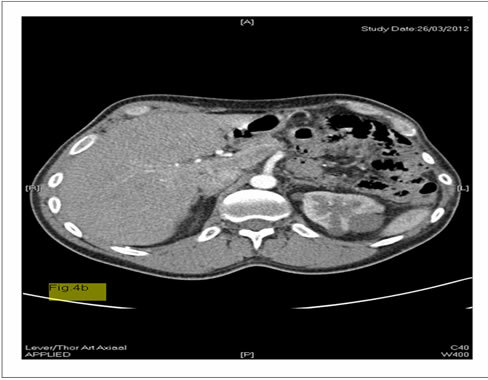 That’s why we want to share our experience with pemetrexed as second line therapy for recurrent thymic tumors by publishing the following case reports. 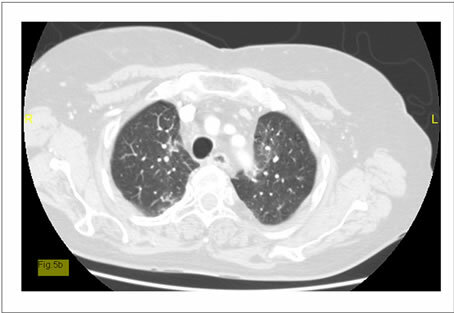 A 43-year-old Caucasian man, nonsmoker, was presented in 2006 with fever, weight loss and dyspnea. His medical history revealed brachialgy due to facetarthrosis at level C5-6 with damage to the nerve C6 because of an accident. 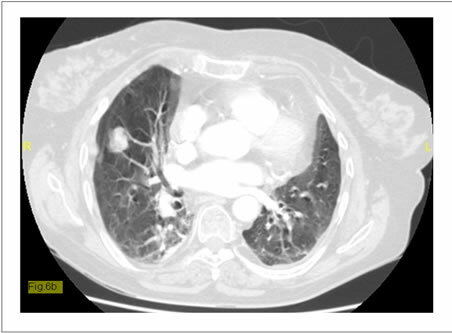 At initial presentation, CT-scan reveals a mass in the anterior mediastinum with invasion of the left pleural cavity. There were no arguments for distant metastases on PET-CT. Biopsy by parasternotomy confirmed the presence of an invasive thymoma, mainly existing of epithelial cells with 100% positive EGFR immunohistohemistry (IHC) and negative IHC for CD 117. Pre-operative chemotherapy existing of cisplatinum, endoxan, oncovin and adriamycine was started. CT after 4 cycles showed partial response and a surgical procedure was proposed. During surgery metastatic deposits were detected on the right hemidiafragma so that the procedure was prematurely ended. No further treatment was recommended at that time. In August 2007, follow-up CT showed a minimal progression of the mass and the patient was sent to our centre for a second opinion. At this moment he presented with important post-thoracotomy pain on the left side and a mild degree of dyspnea. In the multidisciplinary board, maximal debulking after induction chemotherapy (cisplatinum-etoposide) was advised, followed by postoperative radiotherapy. The patient decided to wait because of his difficult recovery after the explorative thoracotomy in 2006. In June 2008 he presented with an objective clinical and radiological progression and he was treated with 4 cycles of combination therapy consisting of cisplatinum-etoposide. A partial respons was observed with relief of pain and night sweats. Patient again refused debulking. 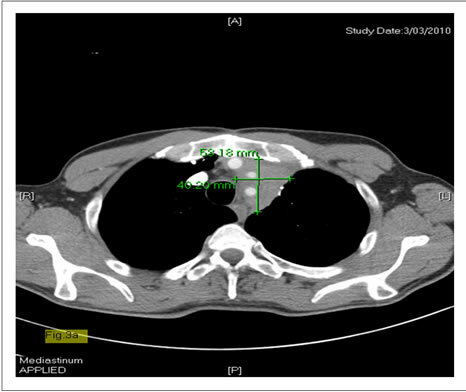 Four months later CT-scan showed progressive disease with invasion of the neuroforamina of the thoracic spine (level T9-10) without compression of the myelum or invasion of the vertebrae. 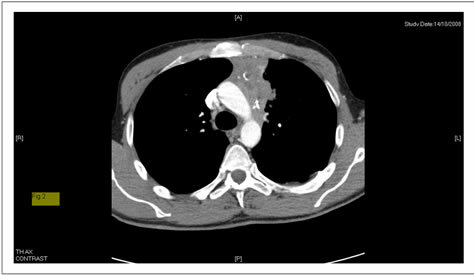 At this time patient agreed with surgery with partial debulking of the thymoma masses in the left mediastinum followed by a second procedure with resection of mediastinal mass via sternotomy (Figures 1 and 2). Despite the effort, the resection was considered to be incomplete because of the invasion of the aorta, the left arteria pulmonalis, the vena brachiocephalica and the pericardium. Imaging after surgery showed successful debulking with important regression of the total volume with only presence of a tumor rest paramediastinal left and retrocardial and at the left parietal pleura. In the multidisciplinary board it was decided to give postoperative radiotherapy in a total dose of 50 Gray on those sites with residual tumor. Figure 1. Thymoma before surgical treatment (case 1). decided to give a systemic therapy consisting of 3- weekly pemetrexed, based on a few studies where they achieved good responses with pemetrexed as second line therapy (e.g. A phase II study  of P. J. Loehrer). The patient started pemetrexed treatment at 13/04/2010 and tolerated this therapy very well without hematological toxicity. After 4 cycles there was an important regression of the residual masses and a relief of the symptoms. We continued pemetrexed as maintenance therapy. Till now there is still confirmed partial response on CT after 28 cycles of pemetrexed monotherapy with only a mild degree of tiredness (Figures 3(a) and (b), 4(a) and (b)). Figure 2. Thymoma before surgical treatment (case 1). Figure 3. (a) Baseline CT thymoma (case 1) before pemetrexed; (b) Thymoma after pemetrexed (case 1). Figure 4. (a) Baseline-CT (case 1) before pemetrexed shows lesion at the left costodiafragmatical sinus; (b) CT (case 1) after pemetrexed shows complete regression of the lesion at the left costodiafragmatical sinus. A 59-year-old Caucasian woman was diagnosed with thymic carcinoma in June 2011. A biopsy showed a thymic carcinoma consisting of poorly differentiated squamous cell type. She was sent to our hospital for a second opinion. The multidisciplinary board decided to start combination chemotherapy cisplatine-etoposide. After completing 6 cycles of the chemotherapy, CTevaluation in October showed stable disease. 2 months later in December, she presented with progressive dyspnea due to a vena cava superior syndrome. 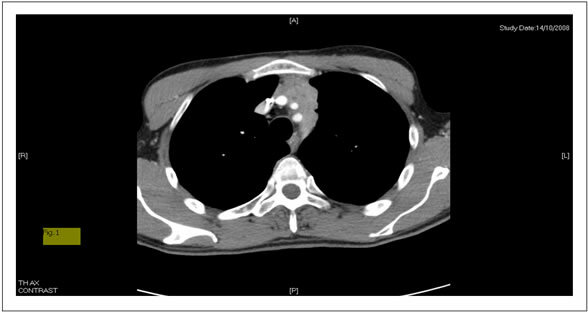 CT revealed progressive disease with pressure of the mass in the anterior mediastinum on the adjacent vena cava superior. She was treated with radiotherapy, 23 Gray in combination with systemic steroids. Because rapid progression within 3 months after first line chemotherapy, we started pemetrexed as second line therapy, based on our good result with pemetrexed in our first case. After 2 months of therapy an astonishing response was observed on CT. At this moment patient is continuing pemetrexed therapy without major toxicities (Figures 5(a) and (b), 6(a) and (b)). Figure 5. (a) Baseline-CT (case 2) shows pulmonary metastatic thymic carcinoma; (b) Regression of the pulmonary dissemination of the thymic carcinoma after pemetrexed (case 2). Figure 6. (a) Baseline-CT (case 2) shows pulmonary metastatic thymic carcinoma; (b) Regression of the pulmonary dissemination of the thymic carcinoma after pemetrexed (case 2). Surgical resection is the mainstay of thymoma treatment. The preferred therapy for non-metastatic or locally advanced thymomas consists of maximal debulking with or without induction combination chemotherapy and/or adjuvant radiotherapy [15-17]. Prognosis is determined by completeness of resection. The reported operative mortality is an average of 2.5% (0.7% - 4.9%) Three retrospective charts audits [18-20] and a survey  with greater than 1000 patients reported outcomes associated with primary surgical resection as part of multimodality strategy. Five-year overall survival rates were reported by stage. For stage I, 5-year survival ranged from 89 to 100%; for stage II 71% to 97%; for stage III 68% to 89%, and for stage IV 47% to 69% . Despite reduced survival in advanced disease, maximal debulking surgery seems beneficial, facilitating radiotherapy and thereby improving survival. Lately there is a tendency to perform minimal invasive procedures in which several access incisions can be used without sternotomy or thoracotomy with the intent of a complete resection [22,23]. However, we still need studies to properly assess this approach in terms of indications, success rates, complications etc. At this time, minimally invasive approaches are not considered the standard of care and not recommended [21,24]. • Doses and irradiation fields depend on the completeness of the resection (R0, R1 or R2) and give different outcomes [25-27]. Clips placed during surgery can help to define the target volume . The doses that are given vary between 40 and 64 Gray in fractions of 1.8 to 2 Gray . • Postoperative radiotherapy is not recommended for stage I, neither for stage IIA disease. Radiation should be considered in patients with high risk factors: stage IIB, close surgical margins, WHO grade B type and tumor adherent to pericardium . Radiotherapy for unresectable or locally advanced disease. 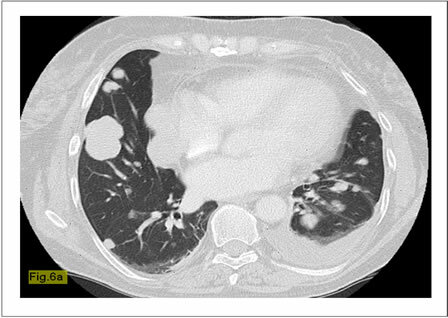 • Stages III and IV thymoma with significant macroscopic infiltration to neighboring structures are rarely completely resectable. In incompletely resected invasive thymoma, whether tumor debulking following radiotherapy influences prognosis and local control remains unclear [10,17,30]. • Radiotherapy can also be given in pre-operative setting with or without chemotherapy to minimize the tumorload. Surgery can be performed when a proper response has been seen on imaging 3 - 6 weeks after the completion of treatment . Limited data on the outcomes with neoadjuvant chemoradiotherapy are available . The three available prospective studies included a total of 61 patients and ranged in sample size from 16 to 23 patients [31-33]. PAC (cyclophosphamide, doxorubicin, cisplatin) was the most commonly used chemotherapy regimen, although one trial investigated ADOC (cisplatin + doxorubicin, vincristine, and cyclophosphamide). Resections were performed after chemotherapy, with varying degrees of success. Overall response rates ranged from 70% to 81%; complete responses were much less frequent and ranged from 6% to 22%. Five-year survival varied considerably and ranged from 31% to 95%; progression-free survival was substantially lower and ranged from 31% to 77%. In patients with local recurrences radiotherapy can also be used. Though it’s important to define the type of recurrence namely in-field, marginal recurrence and out-offield so that radiotherapists can use this data to ameliorate target delineation . Radiotherapy-related toxicities include esophagitis, pneumonitis, dermatitis, pericarditis, arrhythmias and coronary artery disease. Because thymomas are indolent tumors, the knowledge about acute (within 3 months after RT) and chronic (after 3 months) toxicities is relevant. • Limited data on outcomes associated with chemotherapy as the primary therapy in advanced thymoma are available. In most studies, the number of patients is too limited to permit meaningful statistical comparisons. Chemotherapy is offered to patients with advanced thymomas (stages III to IV) on the basis of evidence from small phase II studies in either the neoadjuvant or refractory/recurrent disease setting. No validated biomarkers exist to predict response to chemotherapy [34,35]. • In patients with metastatic disease, chemotherapy is used as a palliative modality to improve tumor-related symptoms and to achieve tumor response. Three to six cycles are recommended. Chemotherapy regimens varied among the trials and included octreotide, cisplatin, etoposide, ifosfamide, and others. A trial, conducted by the European Organisation for Research and Treatment of Cancer (EORTC), with cisplatin and etoposide in 16 patients with advanced thymomas, demonstrated an ORR of 56% and a MS of 4.3 years . Another study is an intergroup trial who investigated a three-drug combination (cisplatin, doxorubicin and cyclophosphamide = PAC) with an ORR of 50% and a MS of 38 months . In 2011, the PAC regimen is considered standard first-line chemotherapy in most centers . • In the curative intent, chemotherapy can be part of multimodality treatment. Resectability and survival may be improved with multimodality treatment (preoperative chemotherapy, surgery or/and radiotherapy) in patients with stages III and IV thymomas. When R0-resection is possible, patients undergo surgery within 8 weeks after the last cycle of chemotherapy. When R0-resection isn’t thought to be feasible or the patient has a poor performance status, definitive radiotherapy  can be administered instead of surgery but still with a curative intent. The interval between chemotherapy and radiation mustn’t exceed 6 weeks. Prospective large trials are warranted to help identify the optimal multimodality therapy for thymoma. • Postoperative chemotherapy is defined as chemotherapy after surgery. It usually starts within 12 weeks after the procedure and the regimens are the same as used in primary chemotherapy. Because of the low incidence of systemic recurrence of thymomas, current guidelines don’t recommend the administration of postoperative chemotherapy for thymomas [10,39]. The molecular pathways involved in the carcinogenesis of thymic malignancies are under investigation and targeted therapies have been studied . • Somatic activating epidermal growth factor receptor (EGFR) mutations are extremely rare in thymic malignancies except for a few isolated case reports in Asian patients. Overall results from EGFR tyrosine kinase inhibitors have been disappointing in patients with thymic malignancies and, at present, these therapies cannot be recommended . • VEGF-A, VEGFR-1, and VEGFR-2 are overexpressed in thymoma and TC [40,41] and microvessel density and VEGF expression levels have been shown to correlate with both tumor invasion and clinical stage . However, there are limited data regarding the efficacy of angiogenesis inhibitors in thymic malignnancies. Sorafenib and sunitinib have not been studied in formal clinical trial settings, although case reports have described evidence of the activity of these agents in thymic carcinoma [12-14]. • Thymic malignancies have shown c-KIT positivity by IHC in 73% to 86% of TCs. Despite a high frequency of KIT expression in TC, the rate of KIT mutations is low at 9%. Several mutations are observed with a few who are sensitive to imatinib, nilotinib or sorafenib . Further investigations at c-Kit mutations and their sensitivity to c-Kit inhibitors should be conducted. • Belinostat is a pan-histone deacetylase inhibitor. In a phase II trial , two partial responses in patients with thymoma, 25 patients with SD, and 13 patients with progressive disease were reported. There were no responses in TC. An ongoing phase II trial is investigating belinostat in combination with PAC as first-line therapy in patients with advanced thymic neoplasms (NCT 01100944) . • The administration of corticosteroids can lead to reduction of the tumor size in lymphocytic thymomas (type AB, B1 and B2) due to lympholytic effect with no antitumor effect. A dose of 0.5 mg/kg/d of prednisone [44,45] is recommended. • Somatostatin (SST) receptors belong to a superfamily of G-protein-coupled receptors with several transmembrane-spanning domains . SST receptors are found in TET tissue, and SST receptor scintigraphy that uses radiolabeled octreotide can be used to identify locally advanced and metastatic disease. In a Eastern Cooperative Oncology Group (ECOG) prospective study (38 cases of which 6 were not pure thymomas)  patients were given 0.5 mg octreotide subcutaneously three times daily. After 2 months, the non-responders were removed from study, the responders continued with octreotide alone and the patients with stable disease were given octreotide in addition with prednisone 0,6mg/kg daily. The 1- and 2-year survival rates were 86.6% and 75.7% respecttively, indicating that octreotide alone has modest ac tivity in patients with octreotide scan-positive thymomas but can be considered for treatment of recurrent disease in selected patients. In toto there were 12 responses and progression-free survival was better in case of the combination of octreotide-prednisone. Though further studies are needed to evaluate these results. An ongoing clinical trial is currently studying the efficacy of octreotide in patients with primary inoperable thymomas. • Increased IGF-1 receptor (IGF-1R) expression in TET has a poor prognostic value for OS  and in primary tumors for TTP. Figitumumab, an antiIGF-1R antibody demonstrated clinical activity in a patient with refractory thymoma  lasting more than 1 year. • Pemetrexed, an anti-folate agent that inhibits multiple enzymes in the folate pathways with thymidylate synthase as the main target , has shown some activity in thymoma. These enzymes play a role in the synthesis of nucleotides so that admission of pemetrexed results in blocking RNA and DNA synthesis as well in malignant cells as in healthy tissue. • Pemetrexed was first approved as a first line treat• ment for mesothelioma in combination with cisplatin based on a randomized phase III multicenter trial . Pemetrexed is also approved as second-line treatment in patients with advanced NSCLC after first-line chemotherapy  and as a first line therapy in combination with cisplatin for chemotherapy-naïve patients diagnosed with non-squamous NSCLC . • Retrospective analysis showed a treatment-by-histology interaction for pemetrexed whereby patients with adenocarcinoma had a significant longer overall survival and progression-free survival than other histological types of NSCLC . Further studies revealed the eventually molecular basis of this phenomenon: the higher the TS-expression rate, the more limited the pemetrexed-activity would be [55-57]. This was also proven for SCLC with also a higher TS-expression rate . • A phase II study  evaluated pemetrexed 500 mg/m2 every 3 weeks for a maximum of six cycles in 27 patients with previously treated unresectable stage IVA (n = 16) or stage IVB (n = 11) recurrent thymic malignancies. In 23 fully evaluable patients, two complete responses (CRs) and two partial responses (PRs) were observed. Treatment recommendations for neoplasms of the thymus are difficult to make because of the rarity of these malignancies. The corner stone is multimodality treatment consisting of debulking surgery with or without adjuvant chemo-or radiotherapy depending on the stage of the tumor. Chemoradiaton should be considered in all inoperable patients. Currently there are no guidelines concerning the therapy of recurrent metastatic thymic neoplasms. Because thymic malignancy is a rare disease, large randomized clinical trials are not feasible. Though several cases reports of successful treatment of advanced thymic tumors can deliver new insights in the molecular pathogenesis of these malignancies. These insights can open perspectives for new trials with targeted molecules. Our case reports clearly illustrate that pemetrexed is a valuable treatment option for recurrent thymic malignancies. • Pemetrexed can be used successfully as second line treatment for pretreated thymic malignancies. E. N. Dessypris, “The Biology of Pure Red Cell Aplasia,” Semin Hematol, Vol. 28, No. 4, 1991, pp. 275-284. J. L. Port and R. J. Ginsberg, “Surgery for the Thymoma,” Chest Surgery Clinics of North America, Vol. 11, No. 2, 2001, pp. 421-437. 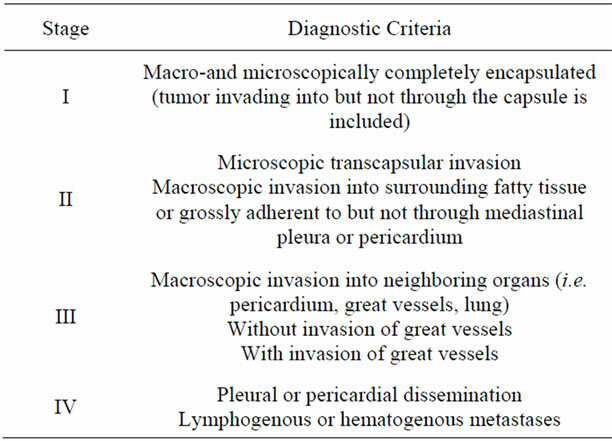 A. Toker, J. Sonett, M. Zielinski, et al, “Standard Terms, Definitions and Policies for Minimally Invasive Resection of Thymoma,” Journal of Clinical Oncology, Vol. 6, 2011, pp. S1739-S1748. 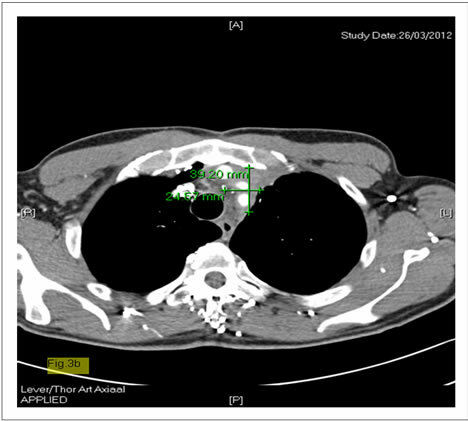 S. Kaseda, H. Horinouchi, R. Kato, et al., “Treatment of Invasive Thymoma Using Low Dose and Extended-Field Irradiation Including Hemi-Thorax or Whole-Thorax,” Kyobu Geka, Vol. 46, No. 1, 1993, pp. 31-40. W. J. Curran, M. J. Kornstein, J. J. Brooks, et al., “Invasive Thymoma: The Role of Mediastinal Irradiation,” Journal of Clinical Oncology, Vol. 6, No. 11, 1988, pp. 1722-1727. P. J. Sr Loehrer, M. Chen, K. Kim, et al., “Cisplatin, Doxorubicin and Cyclophosphamide Plus Thoracic Radioation Therapy for Limited-Stage Unresectable Thymoma: An Intergroup Trial,” Journal of Clinical Oncology, Vol. 15, No. 9, 1997, pp. 3093-3099. G. Giaccone, A. Ardizzoni, A. Kirkpatrick, et al., “Cisplatin and Etoposide Combination Chemotherapy for Locally Advanced or Metastatic Thymoma. A Phase II Study of the European Organisation for Research and Treatment of Cancer Lung Cancer Cooperative Group,” Journal of Clinical Oncology, Vol. 14, No. 3, 1996, pp. 814-820. P. J. Sr Loehrer, K. Kim, S. C. Aisner, et al., “Cisplatin Plus Doxorubicin Plus Cyclophosphamide in Metastatic or Recurrent Thymoma: Final Results of an Intergroup Trial. The Eastern Cooperative Oncology Group, SouthWest Oncology Group, and Southeastern Cancer Study Group,” Journal of Clinical Oncology, Vol. 12, No. 6, 1994, pp. 1164-1168. T. Reisine and G. I. Bell, “Molecular Biology of Somatostatin Receptors,” Endocrine Reviews, Vol. 16, No. 4, 1995, pp. 427-442. C. Shih, V. J. Chen, L. S. Gosset, et al., “LY231514, a Pyrroro (2,3) Pyrimidine-Based Anti-Folate That Inhibits Multiple Folate-Requiring Enzymes,” Cancer Research, Vol. 57, No. 6, 1997, pp. 1116-1123. R. M. Schultz, V. J. Chen, J. R. Belwely, et al., “Biological Activity of the Multitargetedantifolate, Mta (Ly- 231514), in Human Cell Lines with Different Resistance Mechanisms to Antifolate Drugs,” Seminars in Oncology, Vol. 26, No. 2, 1999, pp. 68-73. E. Giovannetti, V. Mey, S. Nannizzi, et al., “Cellular and Pharmacogenetics Foundation of Synergistic Interaction of Pemetrexed and Gemcitabine in Human Non-SmallCell Lung Cancer Cells,” Molecular Pharmacology, Vol. 68, No. 1, 2005, pp. 110-118. P. J. Loehrer, C. T. Yiannoutsos, S. Dropcho, et al., “A Phase II Trial of Pemetrexed in Patients with Recurrent Thymoma or Thymic Carcinoma,” Journal of Clinical Oncology, Vol. 24, No. 18s, 2006. *Conflict of interest: There are no conflicts of interest to declare.